12 August 2017. I did it! 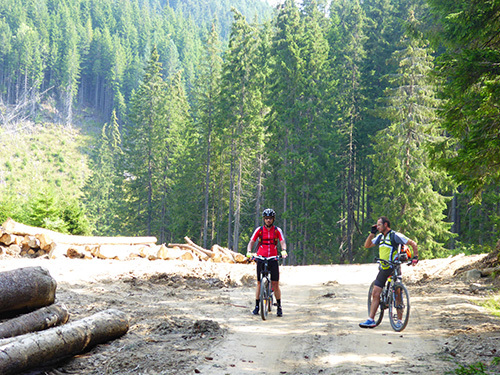 I survived the long weekend of “Discover Romania By Cycling”! 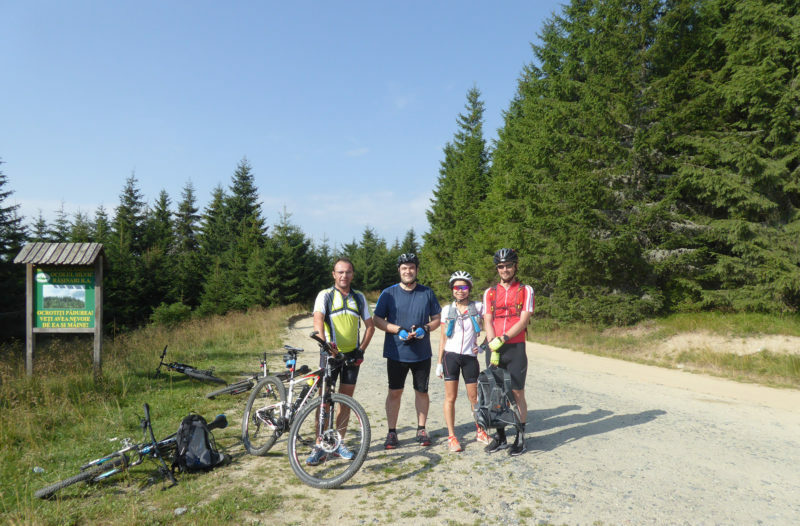 Silviu and his two college friends (Ionel and Nicolae) decided to cycle from Sibiu to the cabana (@Tau Bistra) over 3 peaks. The last peak being the one that I did just the weekend before. The south-westerly route stretched 109km with 60% of it on asphalt, while the rest on gravel/mountain roads. 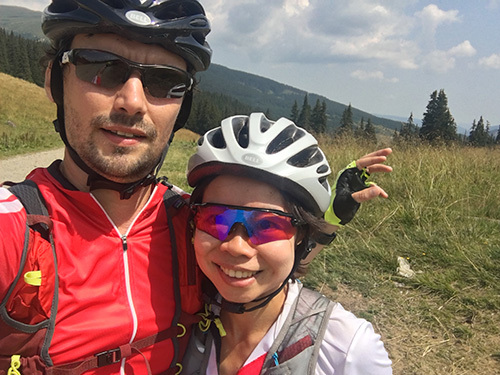 To up the ante, my crazy-half decided to cycle to Sibiu two days before the scheduled group ride. It would be a long scenic route of 93km (versus 60km by car on the highway). The south-easterly route is undulating, except for the 5.1km continuous climb at the 31st km mark. 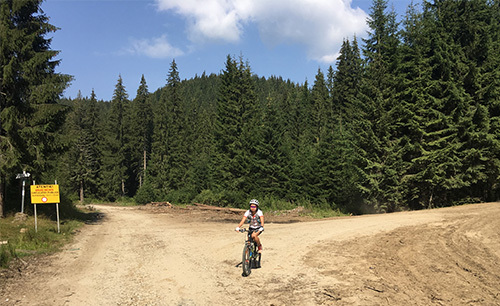 It was a climb from Dobra village to Jina village. When the bike trip was first mooted, I wasn’t too keen on joining the boys. The estimated total elevation gain was 2,178m. 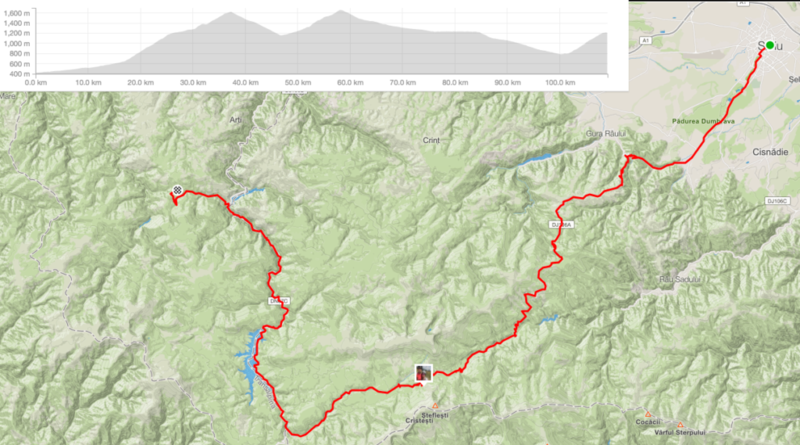 In contrast, the highest elevation gain I had ever done in a single ride was 994m. And that ride was only completed the week before. Furthermore, I was still running on the adrenaline rush of that achievement! However, due to FOMO “Fear of Missing Out,” I agreed to join them. This was provided that I survived the ante put up by Silviu. Top of Jina. Non-stop climbing of 5.1 km averaging 8% gradient. Averaging 8% gradient with infinite number of serpentines, the Dobra-Jina climb took me 45′ 55″ to get to the top. For me, the climb was more of a mental than physical challenge. 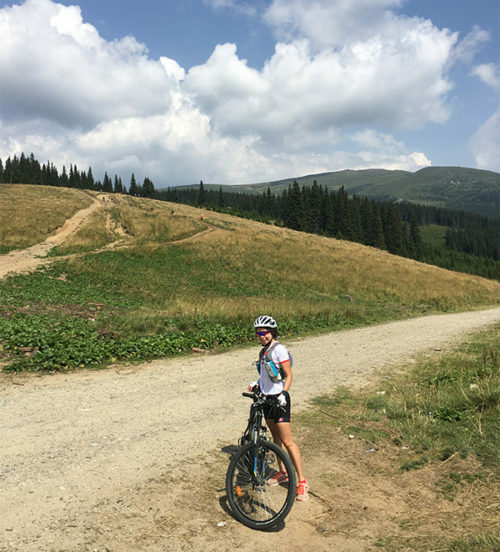 After a while, the fatigue of the quadriceps was pushed to the back of the mind, while the hypnotic silent chant of “just one more push on the right pedal, another push on the left, another one on the right…almost there” continued until I saw Silviu, waiting for me at the top. I was super satisfied with myself for completing the ride, neither resting nor giving up. My reward for the climb: view of Jina as we descended from the top. Instead of a comfortable one-hour car ride to Sibiu, we reached Sibiu after 5.5 hours under the hot sun. Another reward for taking the long ride to Sibiu: view of the pretty village of Poiana Sibiuliu, after Jina. The name signifies the “Glades of Sibiu.” Swathes of golden meadows greeted us as we continued our descent. Since I survived the first challenge, I could move on to the next one. To tackle more than 2,000m/D+ over 109km in one single ride. 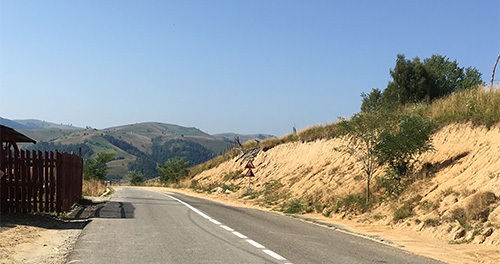 The whole route traverses over three main sections: (a) from Sibiu to the ski resort at Păltiniș in the Cindrel Mountains on DJ106A, a paved road (32km) (b) from Păltiniș to an unknown village (another 42km) on Transcindrel, a dirt road (c) and the rest on Transalpina (DN76C), one of the highest roads of the Carpathian Mountains. The hardest climb for that day was the first section of the first climb. It is not as steep as the one I did two days ago (8%) or the last peak that leads to the cabana (7%), but it is the longest at 15.1km continuous climb, averaging 5%. After 1h 23′ 52″ of self-hypnotic chant, I got finally to the top. Per Strava, I ranked 18th out of 29 women, with the fastest lady finishing in 52′ 35″ during 2017 King of the Mountain, a local race. 4 Musketeers (Starting from left: Nicolae, Ionel, Me and Silviu). Think it was somewhere near the top of the first peak. A female support staff from a MTB race who was there to mark the route, helped us took the group photo. The trip with the boys was more leisurely paced than it would have been if it were only just Silviu and I. The trip took about 11 hours, with a couple of long breaks. But hey, the trip was not a race; life should be enjoyed leisurely whenever it’s possible, especially on such a pretty route! 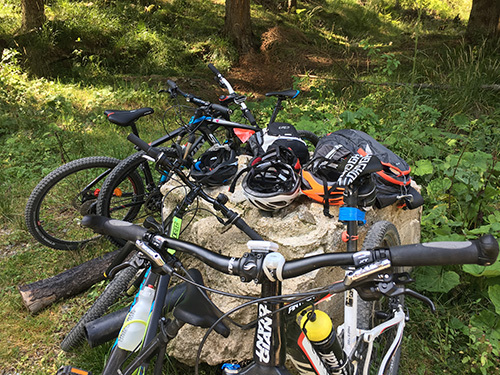 Including the 51km ride back from the cabana to Sebes, I completed 250km on two wheels over the weekend. The intensive riding days in Transylvania, Romania are coming to an end as we have only two weeks left before we return to France. My nether regions desperately need a reprieve as they are not used to being tortured for hours on the saddle. Besides we are going to spend two days hiking in the Retezat Mountains later this week, and start warming up for a 9km running race in Sibiu we have signed up for the following Friday. Bike Chatter. On the way to the first peak. Finally done with the descent of the first peak. I may be the only cyclist who hates descents, especially those on dirt roads. As always, I pinched on the brakes during almost the whole ride down. When I reached the bottom, I was utterly amazed that I was able to cling onto my saddle, and remained in one piece. It shows again that mountain biking and I don’t go together! Two down. One more peak to go. On the background, there was this small, but steep bump. We contemplated for a few seconds of climbing it while waiting for Ionel and Nicolae. The idea was banished just after that few seconds. Obligatory Selfie at the top of the second peak while waiting for Ionel and Nicolae.